Our family owned, sustainably-farmed ranch was purchased in 1924 and is now in our third generation of owners. Smokey Ridge Ranch produces 17 varieties of apples, 5 varieties of wine grapes, olives, figs, chestnuts,pumpkins and 3 varieties of pears. All of the fruit is only picked when if is fully mature to ensure full tree and vine ripened flavor. The Smokey Ridge Ranch includes a seasonal pond, Native American sites, sections of the Pony Express Trail and abandoned mine sites. Apples, figs, pears, persimmons — we pick-as-we-go, guaranteeing you the freshest, tree ripened fruit. It is really right off the tree!!! Our 17 varieties of apples include old fashioned standbys like Winesap, Jonathan, Macintosh, Granny Smith, Rhode Island Greenings, Arkansas Blacks, Red Delicious and Golden Delicious plus newer varieties including Mutsu (our most popular! ), Jonagold, Pink Lady’s and early and late season Fuji. We always provide tastings so you can compare varieties side by side. You’ll be amazed at how different they taste! Not all apples varieties are ripe at the same time each fall. Looking for a particular variety? Pick the perfect pumpkin for your fall decorations! The patch is a short stroll through the wine grapes where you can pick your prize pumpkins right off the vine. Yep, we grow ‘em right here on the farm! None of that trucking them in and scattering on the ground for us! We also have colorful small gourds for sale. 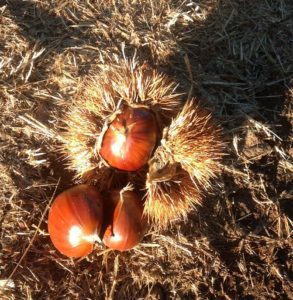 Stop by and enjoy sauntering through the orchard gathering chestnuts that have fallen from huge, beautiful, 40 year old trees. The nuts are meaty, large and sweet. Chestnuts are usually available in late September through October. We will send you updates on availability via our newsletter — sign-up below! Or call 530.626.5077 to check on the harvest. We love offering our innovative jams, jellies and condiments — with a recipe and food pairing notes. These are great for gifts! 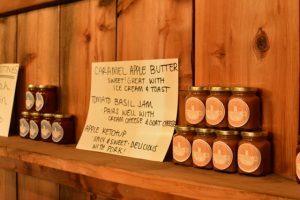 Smokey Ridge produces gourmet preserves and condiments with ingredients grown right on the farm including Tomato Basil Jam, Apple Catsup, Caramel Apple Butter, Wine Jelly and new this year Fig Rosemary Jam!